You are here: Home / Life and Inspiration / What Makes You Jump For Joy? 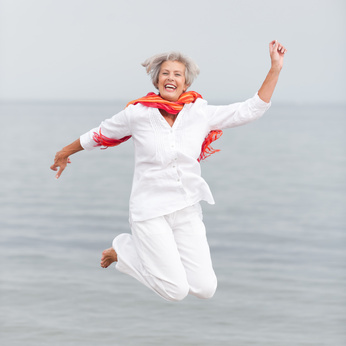 I saw today’s prompt and I started to think – what makes me jump for joy? Actually, I don’t jump – if I did, it would probably set off something that would result in a tsunami! However, my heart does jump (it does a lot of other tricks too, but I’m not telling!) and there’s several things that can set it off. My heart jumps for joy when I receive gestures of love from my husband and family, friends and yes, even from Pablo. It jumps for joy when I have accomplished something as simple as cooking a good meal, writing a good post or doing a good turn for another. My heart jumps for joy when I hear a particular song or a piece of music that reminds of someone or some event. When I read a story of triumph over handicaps or the heroism of a simple person, my heart jumps for joy. A quiet time of reflection and prayer – when wisdom comes – when forgiveness is received – when forgiveness is given – and when I know that I am loved unconditionally by God – that’s when my heart jumps for joy! –I love the things you find joy from, Corinne. I find joy from reading fabulous writers and poetry. I love the way you expressed that the heart can jump for joy. Even though this life has more pain than happiness…we all have moments when we can enjoy the true beauty of happiness. LOVE makes my heart leap with endless joy. Thanks for sharing my friend. I am Doris used every single spell worker on the internet, spent untold amounts of money and discovered they are all fakes…i was the fool though; doing the same thing over and over again and expecting different results. In the end, I decided that I wanted a tarot reading to know what my future held for me; I contacted a woman who lives locally to me and she told me about a man named (priests meruja); he does not advertise on the internet, has another job for income, has no set prices, makes no false promises and refuses to help anyone that cannot be helped and even helpsfor free sometimes, he will give you proof before taking money. He is a wonderful man and he was the only person who actually gave me real results. I really hope he doesn’t mind me advertising his contact on the internet but I’m sure any help/ extra work will benefit him.contact him as nativedoctor101@live.com He travel sometimes.love marriage,finance, job promotion ,gambling voodoo,lottery Voodoo,poker voodoo,golf Voodoo,Law & Court case Spells,money voodoo,weigh loss voodoo,any sicknesses voodoo,Trouble in marriage,it’s all he does Hope this helps everyone that is in a desperate situation as I once was; I know how it feels to hold onto something and never have a chance to move on because of the false promises and then to feel trapped in wanting somethingmore. his cell phone number 5182932141 ! The freedom to follow my passion. Giving love and receiving love. @cathymbeebe Thank you for sharing, Cathy. Beautiful sentiments. Your heart is full of joy, because it is full of love Corinne. I can see your heart in your writing. So many things make me jump for joy. Sometimes it’s as simple as hearing a cute story about my grandson and knowing that my daughter and son-in-law are such good parents. Other times, the view of the sunset bidding farewell fills me with a feeling of peaceful joy and trust in the universal order of things. @Myrna I so appreciate what you said. I know how authentically you write – it makes me feel so connected to you and if you can see ‘me’ in my posts, I’m thrilled – another jump for joy moment. @LisaMarie777 Coffee, a journal and a juicy pen sounds like heaven! Someday I hope to visit your backyard! My wife coming into my office in the morning to say good morning and to share a kiss. Cooking a meal that others really like! Producing a great image in post production!! @JimBrandano Just beautiful – thanks for sharing. Yes, I know how much of a treasure a pinch of salt can be when you’re on a salt-free/ reduced diet! I jump for joy when I can get through a day without anyone asking a single thing of me! @styler1 Thanks for sharing, Sandra. I jump for joy when I am moved by someone getting good news! I feel their excitement and want to celebrate with them! Makes me feel good just thinking about it! I jump for joy when I am reading an inspiring blog or a book, when my daughter laughs, when I send a message of thanks, when I swim in the deep waters, and go for long walks in the trees, and watch old albums and when I meet my friends ! what a lovely post. These days not many things are making me jump with joy. But a nice book, meeting a good friend, being with Nature and a romantic dinner with hubby all make me happy. I understand and thank you for sharing. @RituLalit It’s always the simple things that bring the most joy, don’t they, Ritu? Remembering to be grateful is a double blessing I think. My heart leaps for joy when I see the sun rising over the treeline outside my window and my senses are enveloped with its warm embrace.My heart jumps for joy when I’m out in the woods with my kids and watch them run with light-hearted ease along the river’s edge. @JessicaMokrzycki Thanks for sharing, your sentences felt like poetry to me, Jess. I didn’t really jump for joy, but I sat for joy today! After a very very busy week, I had some free time this afternoon. The weather was lovely, so I made a cup of tea and sat in the back yard reading a novel. I was full of joy! @galenpearl Sitting for joy is just as wonderful. Glad you enjoyed your afternoon, Galen. @MelissaTandoc Children do have a way of helping us to be more joyful. PS: Thank you for sharing. I’m wondering what the strange sign next to your name is – and it’s a link. Wonder what that is? @nikky44 So we better not jump together 😉 Yes, a message of any sort from a loved one is always a time for joy. @hudakcollins That’s exactly why I admire you so much – you can see beauty and positivity in everything, Mary. Corinne, you could have been describing me exactly! I especially jump for joy when God inspires me from scripture and gives me a story to share on Meditations of my Heart. Experienced that just moments ago! @marthaorlando Inspiration is definitely a cause for joy and I’m sure you’re joyful very often through the day. I enjoyed reading this. I also am glad to learn what EG is. I feel the same way and jump for joy for the same reasons you do. I love seeing someone do something nice for someone without being asked, seeing my husband after a long day of work or when he sits and looks at a card I made and offers his opinion and advice. The daily small stuff all add up to the big stuff. Thank you, Winnie. I like what you said – the small things do add up. I’m trying to find a link to your blog/site. I’m with Linda, getting that perfect shot makes me jump for joy, also when my husband pulls in the driveway my heart jumps and a smile appears, I am blessed with so many things that make my heart jump for joy, the 3 kids that live with me when they smile and run to my arms, the kitties and puppy when I get home and they all greet me with love…so many more. Great post Corinne. @jovane4685 I can imagine how much a good photograph would make for a joyful moment for you, Jan. And children and animals do make us jump for joy. Writing a good story always makes my heart sing and if I get it down in a poem, then I am soaring. @BrendaMoguez Then you must be jumping for joy all the time with all the good stories and poems you write, Brenda. Corinne, YOU truly make me jump for joy! I feel as though I found a kindred spirit on the other side of the world and we are fortunate enough to have found each other via the Internet. True soul connections – they make me jump for joy! @Elizabeth Young I’m so touched by your comment. Yes we are so blessed to be connected. Hopefully, we can meet someday and jump for joy together, Elizabeth! I do actually ‘jump’ for joy — haha! And clap!! @DangerousLinda I can picture you doing that, Linda and I’m smiling at the picture! @privytrifles Yes, that God can be so bothered about the details of our life is a cause for joy. Almost all the very things you have mentioned Corinne.Nice post. I love this post, because I don’t jump either. (For me it would be more like jump and sprawl, due to some balance issues…) As you say, for those of us who cannot jump, our hearts are still moved by certain elements of this world. Good music makes me jump for joy inside, and random acts of kindness are much the same…which is why I get so excited by blog comments – people caring enough to join me on this journey is remarkable. My heart jumps for joy at the fact that I have been fortunate enough to be permitted to get this far in life – thank you, Lord! @Casey B Thank you for sharing. I’m so happy to be connected with you and be a part of your journey, Casey. May you continue to find joy in all you do.